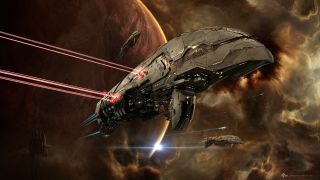 A lot was announced at the Fanfest keynote for EVE Online. New ship skins, a completely overhauled player-owned structure system, building fittings, ghost fittings, and more. The most mysterious teaser, though, was CCP's plan for "emergent threats". The studio promises that even they don't know what the AI will be capable of when mysterious forces are unleashed into the game later this year. They do, however, have a trailer to whet your appetite. It's not as emotive a trailer as last year's brilliant This Is Eve, but it should nevertheless mysteriously hint at the mysterious direction of CCP's mysterious emerging threat. The ultimate plan, CCP says, is to create a system where they no longer need to announce new events and threats. Rather, the system is designed as an unpredictable sandbox, providing constant new things for Eve players to experience (and fight).